The I-7510/I-7510A provides 2-way optical isolation between one piece of RS-422/RS-485 equipment and the rest of the system. It can also be used as a repeater to extend the transmission of an existing network. Additionally, an RS-485 system can be expanded beyond the 256 node limitation imposed by the standard. It can also be used to convert a four-wire RS-422 signal into a 2-wire RS-485 signal, and vice versa. The I-7510AR is exactly the same as the I-7510A, except for the isolation site. 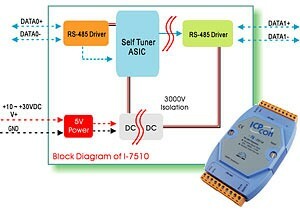 The isolation site of the I-7510A is located in the input interface circuit, but the isolation site of the I-7510AR is located in the input and output interface circuit. In other words the I-7510AR is 3-way isolation repeater module.